I don’t’ know which side I like better. I agree! An incredible single- I’d only put Strawberry Fields Forever/ Penny Lane ahead of it and not by much. Strawberry Fields/Penny Lane may be the greatest single release from anyone…In my opinion, it is the greatest single release. I can’t think of any better! Imagine if those songs had been on Sgt. Pepper.. 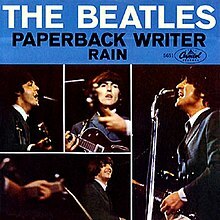 Imagine Rain and Paperback Writer on Revolver..
It’s hard to think of Revolver any better but it would have been… Sgt Pepper would be up higher in my personal rankings if they would have been included…I like it but it’s not Revolver or Rubber Soul to me. You have to add the cultural impact when thinking of Sgt Pepper…sitll a great album. We agree- Revolver and Rubber Soul are #1 and #2 on my Beatles album list- and 50 plus years later both sound fresh! I’m so glad they didn’t record at Stax…I’m at that point in that book. It may have changed a lot on Revolver. I’m more than happy with that British sound. You are right they sound just as good today as when I heard them first. I agree I love what they did at Stax but glad The Beatles didn’t go there. You can’t improve on perfect.. I am having a Beatles Day here- currently up to Help!